I don't smoke. I don't drink. I don't own a dog. And I haven't sold lemonade to neighborhood folks in about 17 years. But you would never know it from all of the evidence on my front lawn. When I cut the grass I usually have to stop multiple times to pick up debris. In the past few years I have found many things in my yard, including but not limited to: cigarette butts, a working lighter, a chewed up cigar, beer cans & beer bottles (empty & full), the packaging of an entire McDonald's Happy Meal, a "Lemonade - 25 cents" sign, half a lemon, plastic spoons & cups, a 7 of diamonds, love notes, class notes, batteries, a mortgage payment stub (not mine), roof shingles, and a white undershirt. Oh, yes. And dog poop. Lots of it. I don't know how all this stuff ends up in my yard. Does the wind just end at my front lawn? Does the stop sign on the corner let drivers pause to throw junk out their car windows? Do people walking by just hate me? 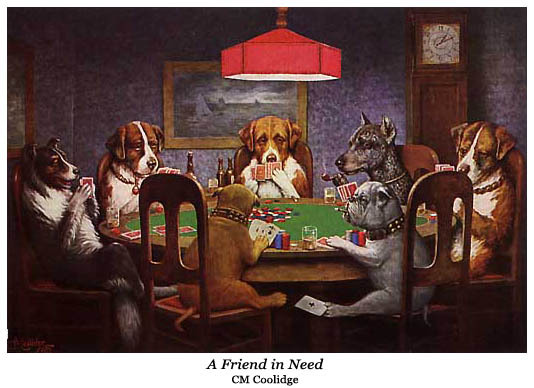 Or is someone planting evidence to frame the characters in the Dogs Playing Poker paintings? Whatever the reason, about once a week in the non-winter months, there I am. Not smoking but with a back pocket full of butts. Not drinking but with a recycle bin full of Budweiser cans. And don't get me started about the other uses for a gardening shovel. I mean, one of the thousand reasons I don't have a dog is that I don't want to clean up after it. But judging from some of the other stuff I've found out there, maybe it isn't the dogs that I should be worried about. Lemonade, anyone? It has been quite a week for sports in Pittsburgh. All three major sports seasons are starting to overlap, and the city is buzzing with excitement. 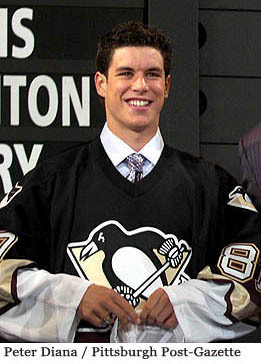 The Penguins won the NHL draft lottery and used the first pick to select future Hall of Famer Sidney Crosby. He is supposed to be the next Mario Lemieux. How appropriate. Even though he is going to save the team and bring multiple Stanley Cups to the city, very few people around here even know what he looks like. Here is a picture of young Sidney. Please don't run him over in your mad dash to the season ticket counter or on the way to get your #87 jersey. The Steelers have started training camp, the first stop on the road to Super Bowl XL. That stands for "40" in football numerals. The crazy fans in this football town always look forward to this symbolic opening of the season, and this year expectations are as grand as usual. 16-0. One for the thumb. I think I saw some people tailgating at Heinz Field already. The Pirates snuck past last Sunday's trade deadline, managing to give away only one decent player to a division rival in exchange for some guy you never heard of that was pretty good two years ago. They have officially given up on this season and are calling up players from the minor leagues. So why is everyone excited? They have unveiled the All-Star Game logo for next year. That's why. Can you say Home Run Derby into the Allegheny River? Not to be outdone by our professional sports, the Bassmaster Classic was held in Pittsburgh last week, too. What, you say? Bass in the three rivers? I've never caught one and I don't know of anyone who has. Carp, sure. There are carp as big (and ugly) as a Toyota Prius in there. But very few bass. Case in point - the winner of the event actually had the lowest three day total weight ever, setting a Bassmaster Classic record for futility. And these were the best fisherman minds in the country. What did they expect? Even the fish were busy paying attention to all of the sports excitement that was going on in Pittsburgh. Maybe if the so-called "Bassmasters" had used pieces of kolbassi dipped in Iron City Beer as bait they might have had better results. Go Pens! Go Steelers! Go Pirates (next year).